I clean a house on Anna Maria Island by the Crosspoint Church. I had to take my kids on a field trip one day, so my husband cleaned it for me for the first time alone. While he was there cleaning I received a photo of him via text from his phone. 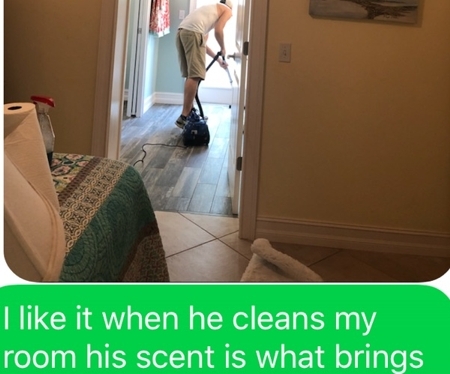 It was the picture was of him vacuuming, and the text read ''I like it when he cleans my room. His scent is what brings me home, but he's so afraid''. I was so confused and texted back saying ''what is that about?'' He then called me confused as well, unsure of what I meant. I told him ''you just sent me a picture of you cleaning'' and told him about the message underneath it. He said ''no, I didn't''. Once he looked at the photo I received and read the message with it, he thought I was playing a joke with him. He kept saying I must have sent someone over there to send that message to scare him. I explained to him ''you're the only person working today, the only person with a key to that home (which was locked while he was inside cleaning). I told him ''even if someone somehow snuck in while you were cleaning, how would they take your phone and use it without knowing your pass code to open the phone?'' He then accused me of hacking his phone and sending the text that way. I was like ''honey, I'm chaperoning a bunch of kids at Disney. How in the world would I do any of that while chaperoning and riding rides?'' At that point he knew there was another explanation. The next time we went together to clean we were on separate sides of the house when I heard him scream. He walked in to tell me he had felt something touch him, so he turned around and saw a dark figure in the corner of the room (while he had goosebumps running up and down his arms and neck). Omg... That's insane! Really scary.